The Christmas tree is down and hauled to the woods (or curb or landfill). Epiphany symbols (wisemen, Baby Jesus) are all put away. There is still one Christmasy thing sitting on my dining room table (besides the poinsettia which I can’t bear to part with until it is totally bedraggled). 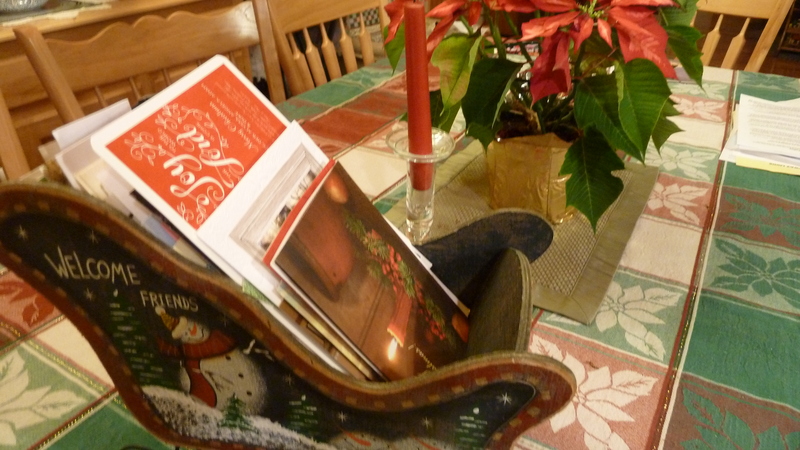 A sleigh full of Christmas cards and greetings. This is one of my new favorite after-Christmas tradition, that I began when I realized we never really took much time to read and savor the messages of friends and family who had bothered to send Christmas cards. 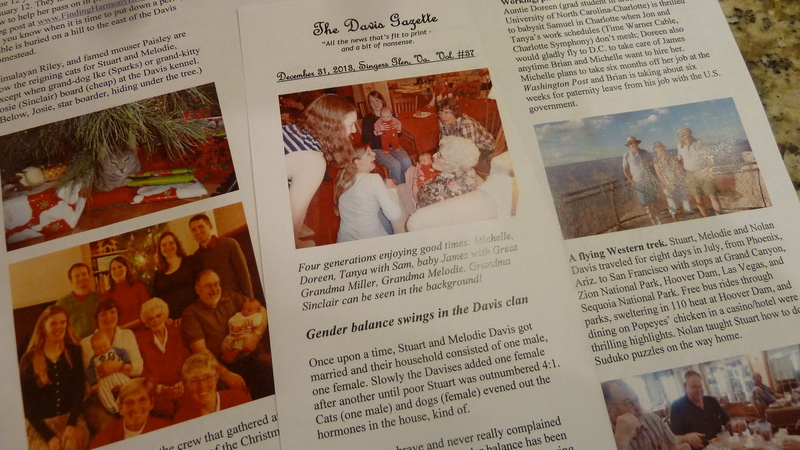 We still appreciate and participate in that custom ourselves, sending a lighthearted picture-filled letter called The Davis Gazette—that always has at least a short line of handwritten personal greeting. Pre-Christmas days find me decorating and shopping and wrapping and baking and barely having time to give cards we receive a quick once over before mounting them intertwined with ribbon around the front doorway. So one year in January we began taking time to read the cards again right before our evening meal, and then including whoever sent the card in our mealtime prayer—asking God to be especially with them and mentioning any particular needs if we are aware of them. I love the way this simple pause carries the love and beauty of the season into the long and sometimes lonesome days of winter, connecting us with friends and far flung family. Some of the cards are truly beautiful works of art. 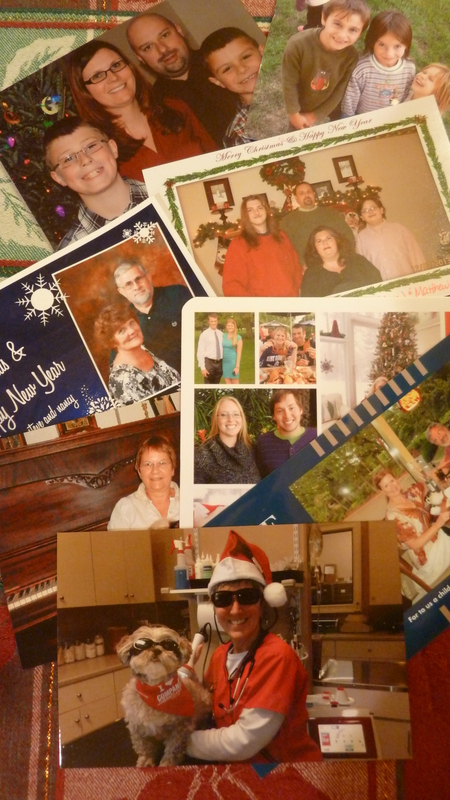 Some of the cards include lovely new family photos. All are great to linger over just a bit and then tuck away in the sleigh where they await recycling in a later year. What do you do to carry the joys of the Christmas season through January? 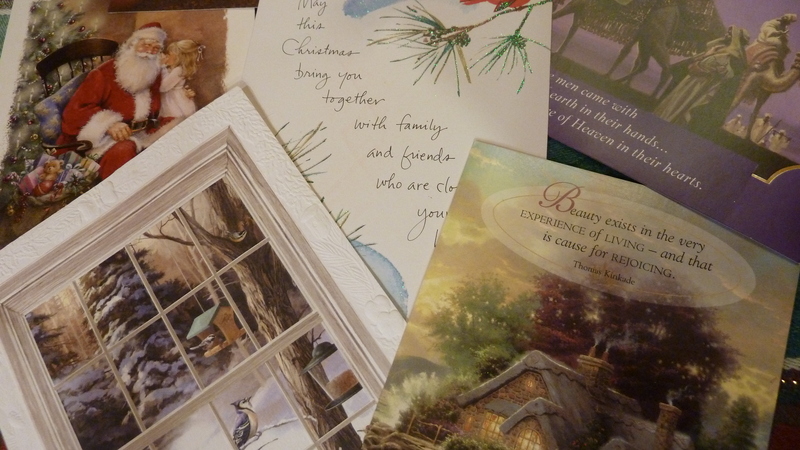 I enjoyed this one very blog much as I have always enjoyed receiving Christmas cards and letters so much. I am sure they thought we had dropped off the face of the earth. Last year we were able to send them out again and this year, although I got behind and did not get time out in time, we did manage to make it a New Year’s message,. We had a picture taken for our new Church directory and I was able to have one of the pix done up with Christmas greetings on it to include with it. We have had some nice favorable comments especailly of my miracle husband, who is an esophageol cancer surviour. Like you, I do not like to just throw them out and I was actually just rereading ours the other day. My mother always worries when she doesn’t receive a card from friends who she usually only hears from at Christmas. She wonders if something is wrong, ill, disabled and so on. So I’m sure your friends were happy to hear from you again, officially! And thanks for following my blog! I’ve signed up for your updates. I like the way you put things–I know you are a good writer. Take care. After you have finished with you tradition with the cards, you can do what my grandmother always did and I do now too. I sit down with pinking shears and look over the cards one more time then cut out the pretty part or some little art piece of the card. Than using a hole punch, punch a hole in the top and insert a ribbon. There you have gift cards for next year. Thanks, Sue! I like that this was something your grandmother did. I have cut out the pretty parts before and made Christmas tags, but never used piking shears or a hole and ribbon. That would finish them off very nicely. At our Clothes Closet at church, one year we each looked for cards that had some form of nativity scene on them, and cut them out in circle shape, tied ribbons on those, to give out as a no-cost Christmas ornament for clients who came, with a Bible verse and sign off from our church on the back. Those were nice too. Thanks for adding this!